Astronomers have a model that explains how the universe was born. The Big Bang is the singular cataclysmic event that started it all: the instant 13.8 billion years ago that marked the fiery birth of the universe. No one was there to bear witness, of course, but physicists and astronomers are confident that the Big Bang theory — or model, as they often call it — provides an accurate picture of how the cosmos came into existence. Physicists sometimes liken space and time to a “soup” of virtual particles continually popping into and out of existence — and theorize that a random fluctuation in this “quantum foam” triggered the Big Bang. What happened at the precise instant things got started is still a bit hazy, but we know what came next. The baby universe expanded rapidly, cooling as it did. One second after the Big Bang, the temperature had fallen to about a trillion degrees Fahrenheit, and protons and neutrons appeared on the scene. 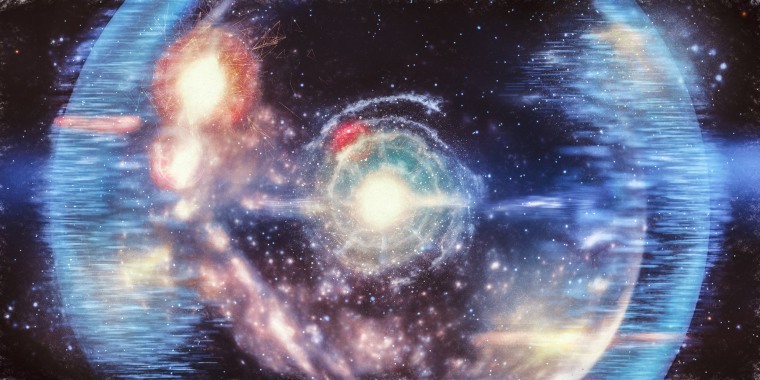 Then came several minutes of nucleosynthesis, when these subatomic particles fused to form the nuclei of the first atoms — mostly hydrogen and helium. SpaceWhat happened before the Big Bang? By 375,000 years after the Big Bang, the temperature had fallen to 5,400 degrees Fahrenheit and the universe became transparent, freeing visible light and other forms of electromagnetic radiation to travel across the cosmos. Much later, some 300 to 500 million years after the Big Bang, the first stars and galaxies formed — and the rest is history. The term “Big Bang” was coined by the British astronomer Fred Hoyle in 1949. But the key ideas go back decades earlier. After Einstein published his general theory of relativity in 1916, physicists began to think of the universe as dynamic and evolving (before the 20th century, most scientists thought of it as constant and unchanging). In the 1920s, astronomers observed that distant galaxies are rapidly receding from Earth and from one another. That observation was consistent with the idea of an ever-expanding universe, and it suggested that the universe had been smaller in the past. In the 1920s, a Belgian physicist and Roman Catholic priest named Georges Lemaître speculated that if the history of the universe could be “run backward,” the universe would become denser and hotter (as well as smaller) until all the matter was concentrated in what he called a “primeval atom” — what we now call the Big Bang. Despite Lemaître’s insight, the idea of an unchanging “steady state” universe persisted for decades. But the clincher came with the 1964 discovery of the “cosmic microwave background” (CMB) radiation, a sort of echo of the Big Bang that persists to this day. What proof is there that the Big Bang actually happened? Several lines of evidence that strongly support the Big Bang model. One involves the relative abundance of the chemical elements that make up the stars and galaxies; the amount of hydrogen, helium, and heavier elements that we observe is just what the theory predicts. The observed speeding away of distant galaxies is another clue, as is the existence of the CMB. More recently, scientists using orbiting telescopes like the Wilkinson Microwave Anisotropy Probe and the Planck observatory have measured the CMB in fine detail — and its characteristics are consistent with the theory. We have a detailed picture of everything that happened from about the one-second mark onward, Carroll says, and theoretical models offer a “plausible” story all the way back to the so-called “Planck time.” That’s when the universe was a mere 10^-43 seconds old (that’s a decimal point followed by 42 zeros and then a 1). No one is sure, and some physicists contend that the word “before” has no clear meaning in this context. The universe “could have been eternal, or it could have had a beginning — we just don’t know,” Carroll says. In recent years, scientists have developed several theoretical models that attempt to describe epochs that preceded the Big Bang. These include the “cyclic model” developed by physicists Paul Steinhardt and Neil Turok, in which “branes” (membranes that exist in a higher-dimensional space) collide periodically to create the conditions associated with the Big Bang, and “conformal cyclic cosmology,” an idea put forward by mathematical physicist Roger Penrose, in which Big Bangs happen repeatedly. But these remains highly speculative.